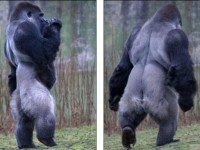 Ambam the Gorilla Walks Like A Man! Meet Ambam, a bachelor Western Lowland gorilla at Port Lympne Wild Animal Park in Kent, England. While most gorillas are happy enough walking around on all fours, Ambam the silverback prefers a more human form of ambulation. To the amusement of his keepers and fascinated onlookers, the agile ape has mastered the tricky art of walking upright on his hind legs for long distances.